A series of quotes relevant to the environment and/or campaigning. This week’s quote comes from Ernest Hemingway (died 1961). When spring came, even the false spring, there were no problems except where to be happiest. The only thing that could spoil a day was people and if you could keep from making engagements, each day had no limits. People were always the limiters of happiness except for the very few that were as good as spring itself. 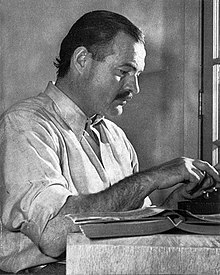 More on Ernest Hemingway here. I once was asked to complete a questionnaire by a prestigious gardening organisation, seeking my views as a keen amateur gardener. One question asked me to identify the biggest problem in my garden; in the options were ,slugs, snails, cats, birds shade, waterlogging among a long list. They also included an Other option. I wrote NEIGHBOURS.